Many species of sea turtles come nesting on Costa Rica’s beaches, but mostly the leatherback, the green and the hawksbill. Not surprisingly they are all endangered, especially from poaching. 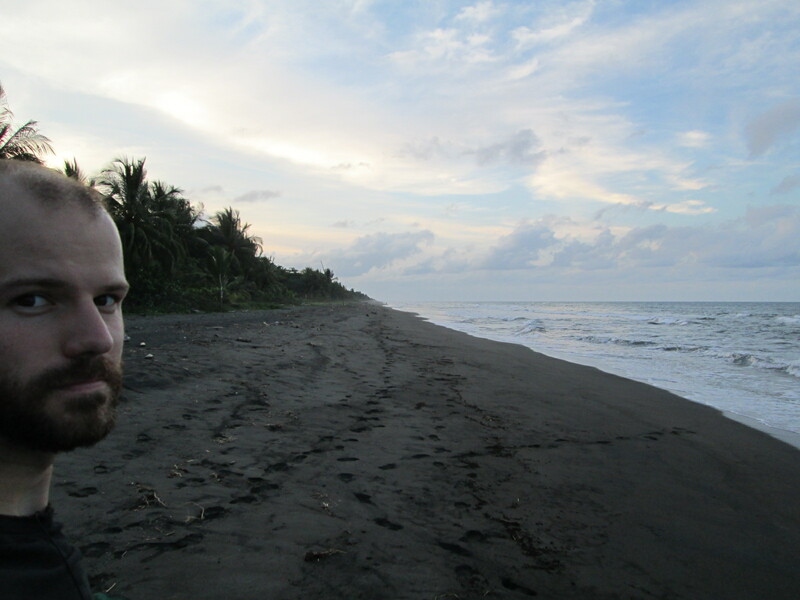 Feeling guilty about enjoying Costa Rica’s natural resources after speaking with Jerry (see Central America – month 1), I figured a bit of volunteering was in order so I decided to join ASTOP in Parismina, a small community on the Carribean coast whose beaches are nesting grounds for sea turtles and likewise a popular spot for their illegal hunting. Volunteering was harder than expected, but otherwise a very rewarding experience which I will make a detailed account of in the following paragraphs. Sadly, there are no photos of the actual volunteering work, everything happened at night and flashes can severely disturb these animals so taking picture was frowned upon. Too bad as they really are dinosaur-scale animals (lthe leatherback I saw was 1,60 meters of length and weighted around half a ton) and are out-of-this-world creatures, they spent most of their living time roaming the seas and only come on land to lay. Having me in the picture could have helped giving a sense of dimension, but trust me, your first encounter is jaw-dropping, and the best part is that it never gets old. Turtles, being reptiles, lay eggs and to lay eggs, you need a nest. Nesting begins when a mother comes up on the beach to survey the area. Not every part of the beach is suitable, on occasions it will be too steep or on others there will be too much vegetation. The turtle will crawl around to judge the site and make her decision. It is quite common that it will return to the water, dissatisfied with what she saw but if the location provides to be suitable, clearing of the area will ensue. The turtle will flap her flippers around while turning on herself to remove as much foreign objects from the sand as possible and then proceed with the actual digging. Using her back flippers, the mother will scoop up sand out of a hole she will excavate as deep as her flippers allow her, throwing the sand away in the face of any unsuspecting volunteer crouching behind to measure the progress. Once the nest has been made, the laying starts. The size and amount of eggs is species dependent, but for the leatherback and the green it hovers around an hundred with eggs being the size of billiard balls for the former and ping pong balls for the latter. Eggs come out two or three at the time and feature of soft shell to make the landing down in the nest a bit softer. With the last egg having been laid, the hole is filled back up and the nest camouflaged as best as possible. 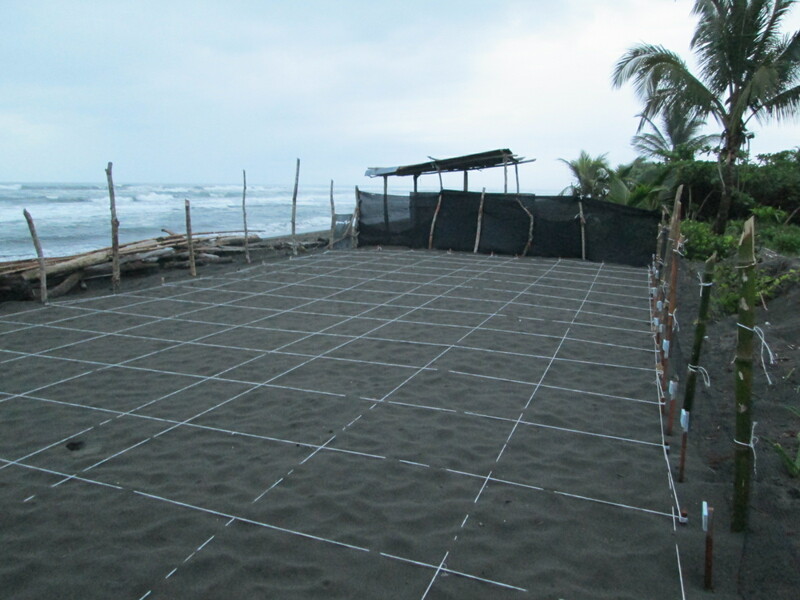 It is no challenge to figure out where a turtle was laying eggs, the beach has obviously been disturbed, but finding the exact location of the egg cavity is no easy task and takes either a lot probing with a stick or the eye of an experienced guide. The process by which these animals build their nest is quite amusing and impressive but it takes some time. They are certainly gracious creatures underwater but on land, they are clumsy, slow and depending of the species, in need to conserve energy as much as possible for the return journey around the globe. As such, they will move their flippers a couple times, rest for a while and repeat, with the whole nesting and laying taking up to and sometimes more than an hour. Suffice to say that during this time, the turtles are extremely vulnerable. While laying eggs, turtles are utterly oblivious to what is happening around them. It is night time, they are near sighted out of the water and not very intelligent animals (“you know turtles, they are not very smart” as would often say Jerry). Talk about the reptilian brain, theirs is about the size of small carrot, most of their skull is occupied by salt-filtration glands. So when busy doing their business, they could not care less about what is happening around them and this made our work a whole lot more easier. Right when the digging is done and the first egg is about to come out, we rush to the hole and fill it with as much sand as possible to make picking eggs up more convenient: nests for the leatherback are typically 80cm deep. As the turtle expels her eggs, you pick them up and put them in a bag. Simultaneously, another person, measures the turtle, inspects it for wounds and records the tag numbers if has any or tags it if it does not. Once the turtle has been cataloged and her eggs have been gathered, it is left to return to the see on her own if it is a leatherback. They have a foul taste and are not preyed on for their meat. Green turtles on the other hand have to be guarded until they return to sea. Then eggs are taken back to the hatchery, where a nest is dug up and one by one they are counted and disposed in the nest as carefully as possible. There the eggs will mature over the next 60 days or so and hatch as newborns, which will be then collected and released back in the sea at different locations on the beach. Volunteer work mostly involves patrolling the beach at night in two shifts, one from 20h00 to midnight and the other from midnight to 4. Volunteers are teamed with local guides who have been formed with working with the turtles. When one is spotted, you follow their orders and try to be useful which may mean crouching behind a massive leatherback reaching for eggs deep down as she lays them, its a good thing they actually do not smell too bad. Turtles do not come out during day time, they rely on the sea being actually brighter than the beach to orient themselves. Sadly, in the process some get lost because of artificial light from the village, but usually, shining a flashlight in their face will guide them back to where you want them to go. Patrols work on two fronts. They protect the nests by relocating them to a safe and guarded place, but they also act as deterrents to poacher by ensuring a consistent presence throughout the night. 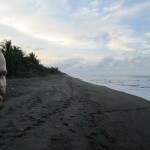 At any given time, two teams of local guides and volunteers are walking along Parismina’s 6 kms of beach. Poachers, when spotted, will most of time walk away, knowing that the practice is illegal and that they will quickly get framed on an island only inhabited by 500 people or so. As a result, the practice has severely lost popularity over the time the association has been active, and except for a few encounters every season (mostly with outsiders), poaching is very much a thing of the past. Mission has not been accomplished tough and never will, other threats exist in the form of dogs, pollution and should the association lower its guard, poachers will surely make a comeback. Walking on loose sand is much harder than it looks: this is no romantic stroll on the beach. Mosquitoes and sand flies are out hunting and over time, stress builds up in all the lower joints from stepping on this kind of surface. Soon, your knees, your hips and your back start aching and your legs, forever itchy from the bites, become full of scars from the uncontrollable urge to scratch. Even at nighttime, the heat and humidity are sometimes crippling in the Carribean, especially as you wear long clothing to protect yourself from the bugs. Turtle sightings are not guaranteed either: during two weeks of patrols, I saw two leatherbacks and one green turtle (quite exceptional since it is not their season yet). This can make the work seem unrewarding and compounded with the hardships of the patrols, has depressed more than a few volunteers into quitting earlier. Thankfully, we got plenty of rest during daytime, as besides the occasional garbage pick-ups and activity with the children, there was not a whole lot to do; I got plenty of work done, helped with the association’s computers, improved the Wikipedia article on Parismina and created one for the association. The rest of the day involved killing time by going for swims, playing pool, befriending other volunteers or developing a fascination for coconuts. 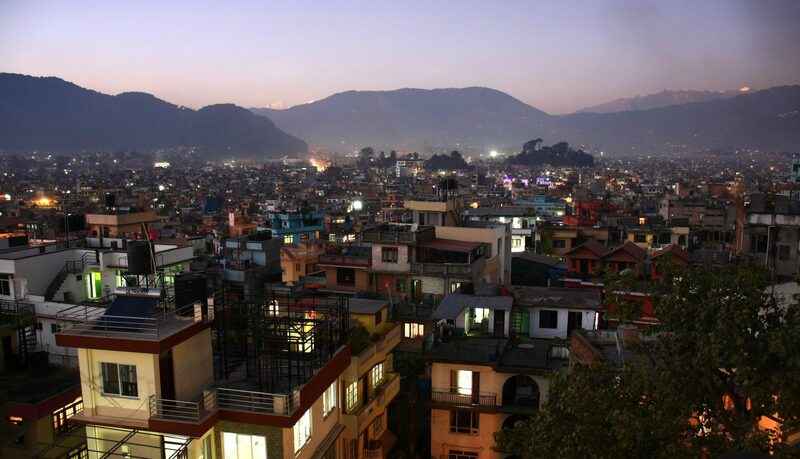 The association provides rooms to accommodate large groups, but most volunteers prefer homestaying with a local family, where for a small fee (17 US$ a day), you get a bed, three meals and your sweaty sand filled clothes cleaned. 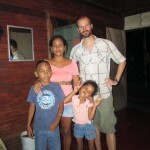 Not a bad deal, but what is most interesting is the cultural experience, which does not come from eating Costa Rican dishes (you can have anything, as long as its rice and beans) but from getting to chat with your hosts, share a moment watching tele-novelas or eavesdrop on village gossip. Parsmina’s inhabitants were religious and simple folks for the most part, but finding more about their outlook on life was enriching and appeasing. While literate, they were never given the opportunity to question anything and frankly this somewhat makes them happier. Sometimes, it felt like the earth was still flat, that the world ended outside the island’s boundaries and that the only measure of time that mattered was whether it was day or night. In terms of material comfort, it was still way below anyone from up north would consider the minimum. A few houses were surprisingly luxurious (some said it had something to do with drug money), but most of them were wooden shacks with rusty corrugated iron roofs. 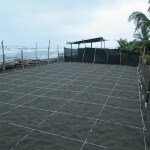 Sleeping without a mosquito net was not an option and at nighttime, you had to share your living space with a wide array of critters: crabs, geckos, tarantulas, cockroaches, etc. Parismina had not been spared by modernity tough, every house was (somewhat) electrified, had running water and basic appliances such as a fridge, a stove and a television. 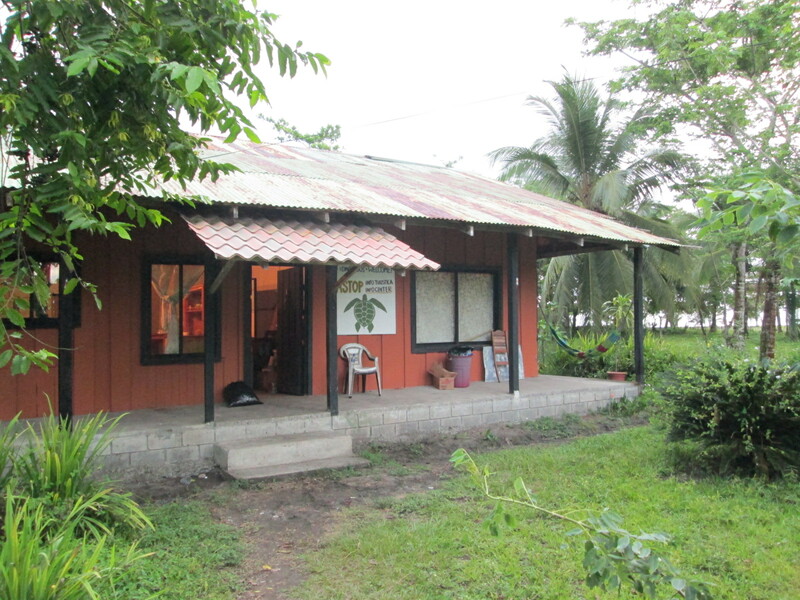 Health wise, the village had its own clinic so everyone was generally healthy and had good dentition but just like the rest of Costa Rica, obesity and its related illnesses were rampant, owing to a diet heavy in starches and fried stuff. e. In the past, I was wrong. Whatever money I spent to the village was handed directly to those providing me services or to the association so if anything, I brought a bit of prosperity to this otherwise secluded island but really, the interactions were genuine and the cause was one worth fighting for: the whole experience was unlike anything I had previously lived. 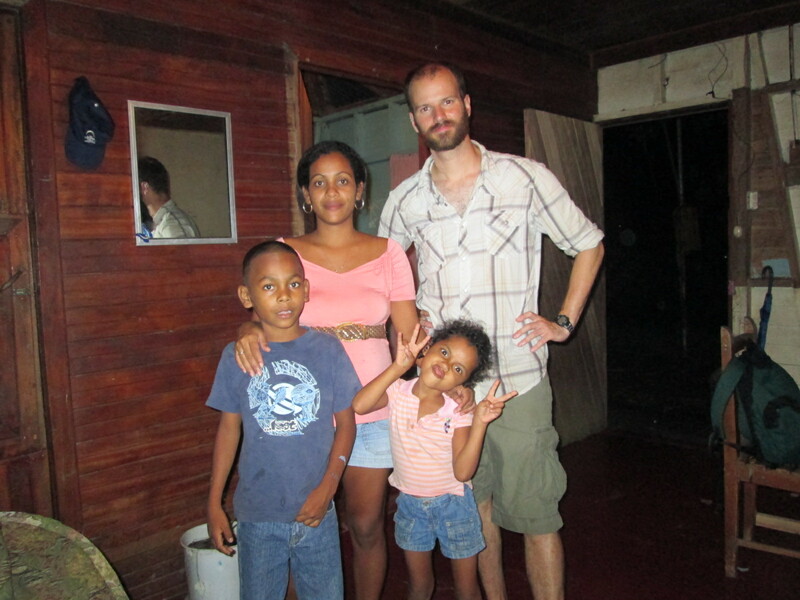 Locals see volunteers come and go with only a handful of them staying long enough to truly have a lasting impact, but all go back to their corner of the planet better individuals and share that betterment at home with their family and friends. While it cannot escape the egocentricity of travelling, voluntourism still fits within a framework of responsible and slow tourism and certainly does away with its exaggerated hedonistic nature. It is an exercise in global awareness, promotes cultural sensibility and provides original experiences to those who try it. I for one will from now on try to devote a portion of my future travels to volunteering on projects like this.